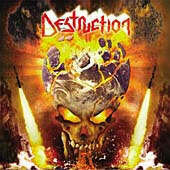 After “All Hell Breaks Loose” which was more or less a market test, Destruction comes back with full force and determination to bring thrash metal to its previous heights. And if anyone would be able to come even close to the once most popular genre that would be Destruction. “The Antichrist” is a big step forward in that direction. If I had to describe this album in one sentence it would be: German thrash metal from the early 80s with XXI century sound and production. Actually, I don’t really know what else can I say... even the cover relates to 1985’s “Infernal Overkill”. Schmier, Mike and Sven play fast and heavy while it seems like they have a lot of fun doing it, and that’s immense because isn’t it the point of making the music to start with? But heaving fun doesn’t guarantee a great album and one of the main reasons that “The Antichrist” falls short of being one is its repetitiveness. Almost all songs are in this same tempo and are heavily influenced by atmosphere of its 80s predecessors. Don’t get me wrong there are a lot of great moments on this opus but if Destruction ever wants to move over their past glory they can’t record its ‘own covers’. If you are a fan of music progression stay away from it but if you are like Peter Tagtgren (the man who recorded this album in his Abyss Studio), a fan of the “Eternal Devastation” authors since day one, “The Antichrist” will blow you away. To sum it up - old fans unite. Bottom Line: I don’t think thrash metal will ever come back to its glory days from the 80s but if it has any aspirations to make a mark on today’s metal scene it would be because of albums like Destruction’s “The Antichrist”.